KABUL — The moment Breshna Musazai climbed onto the stage in a black cap and gown, leaning on a walker and her brother’s arm, the audience burst into applause. 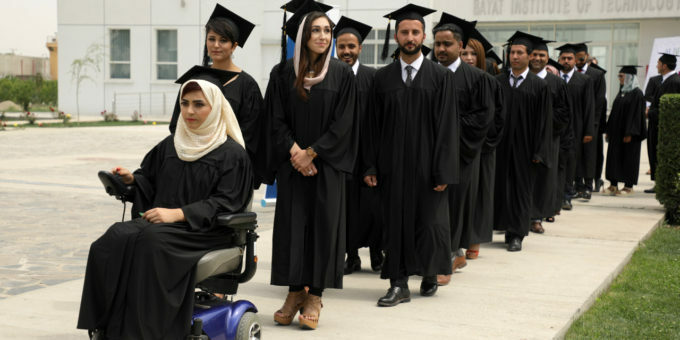 Of the 139 students who received bachelor’s degrees at the American University of Afghanistan on May 11, Musazai, 28, was the indisputable star. Paralyzed by polio in one leg and shot by insurgents in the other, she had triumphed. Her perseverance is remarkable, given the obstacles to higher education that Afghan girls face, even without physical disabilities. Many girls’ schools are closed in areas that the Taliban controls or contests. About 80 girls’ schools closed last week in eastern Nangahar province after the Islamic State said it would attack the schools, according to media reports. About half of all Afghan children between ages 7 and 17 are not in school, 60 percent of that group being girls, according to a UNICEF report released this month. Even in government-controlled areas, a low percentage of girls go to college after finishing high school: Many conservative families do not allow their daughters to remain in school after puberty and arrange for them to marry instead. She attended high school and college in Pakistan, where her family moved before she was born. She also learned English and computer skills. After they returned in 2011, she began studying law at American University, a modern coeducational campus. But on Aug. 24, 2016, as she made her way to the campus mosque for evening prayers, Taliban assailants shot their way into the compound. Students hid in classrooms or tried to escape. Musazai, barefoot and slowed by her paralysis in one leg, struggled to reach the nearest building. Musazai, who needs further surgery on her toes, says she is determined to keep going. As soon as she is able to walk, she said, she plans to seek a master’s degree in law or human rights.